The Food Resources Education Security Health Project (F.R.E.S.H.) aims to work with county government, Native American Nations, and community organizations in east central Wisconsin to improve access to local, fresh food. The Menominee and Shawano area has a combined population of 46,000, with mostly Caucasian and Native American residents. These communities rank poorly in health outcomes, with Menominee and Shawano Counties ranking 72nd and 47th out of 72 counties, respectively. Unemployment is high and median incomes are below the state average; 11.5 percent to 31.4 percent of residents are living in poverty. Menominee County’s childhood poverty rate is 59 percent. Diabetes and coronary heart disease rates are elevated, and obesity rates in both counties are higher than state and national averages. Significant portions of both counties are considered food deserts. Only three Shawano County municipalities have full service grocery stores and Menominee County has only one. Agriculture accounts for a large percentage of economic activity, but only 95 of the 1,200 farms in the area sell local products directly to customers. Coalition members at farmers market in Shawano County, Wisconsin. Photo courtesy The F.R.E.S.H. Project. The F.R.E.S.H. 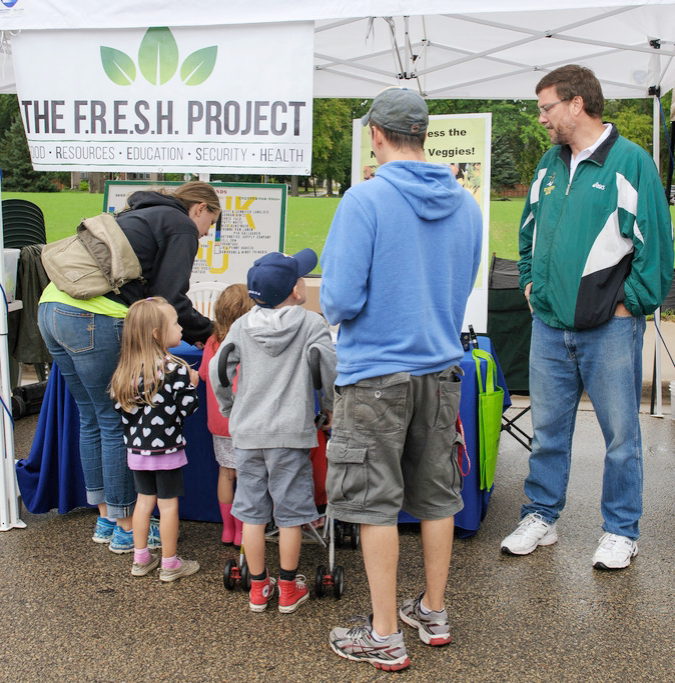 Project built capacity to improve access to healthy food by creating a coalition of planning and public health professionals, University of Wisconsin Extension staff, social service agency representatives, people working in the local food system, and community activists. Data was gathered through surveys and focus groups to analyze barriers to access, understand consumer behaviors, and inform future decision. Ultimately, this project will lead to an enhanced local food system where fresh produce is more readily accessible throughout these communities, making healthier food choices easier and improving overall health outcomes. "Kids make you rethink your eating habits because you want them to be healthy." In collaboration with the Plan4Health national staff, The F.R.E.S.H. Project has provided two training events that were open to the entire community. First, a trainer with the Directors of Health Prevention and Education led a half-day session on creating policy, system, and environment changes, helping the community develop a shared language and common framework for future action. Second, Mark Winne, a national expert on food systems, presented on food systems — and how a food system can be designed to provide healthy food to all people. Both of the sessions were well attended and the feedback was very positive. Begin at the beginning: Think through who will be affected by this effort, and consider inviting everyone to be a part of the leadership at the very beginning. Work at the speed of trust: Relationship building is an end unto itself, not just a means to a goal. Time is important: This means not just amount of time and energy put into the effort at any one point, but patience and length of days--or years--to address an issue. Training and formation are, well ... formative: Provide frequent and high-quality training, as it bonds the coalition members into a shared experience, and also communicates that they are worth investing in. Always stretch to think larger and more inclusively: In the case of The F.R.E.S.H. Project, that would mean doing more to include Amish or Latino communities in the county. In order to sustain the efforts of the coalition and the impact of Plan4Health, a strong organization has emerged that has shared leadership, a concrete set of goals, formal commitments from its partners, and a recognizable name and mission in the community. That history, mission, strategic plan and organization have provided The F.R.E.S.H. Project with funding opportunities that did not exist before the initial Plan4Health grant. This success story was developed in partnership with Dan Robinson, project manager of The F.R.E.S.H. Project. Top image: Shawano Farmers Market, Wisconsin. Photo courtesy The F.R.E.S.H. Project.